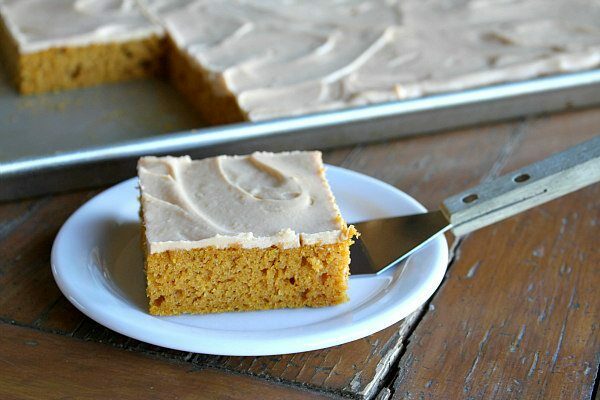 It’s time to celebrate the warm, sweet flavors of fall with this Pumpkin Sheet Cake with Butterscotch Frosting. Now that the leaves are beginning to turn color… and there’s the hint of a chill in the air… and the markets are well stocked with everything Halloween, it’s time to bake some pumpkin things. 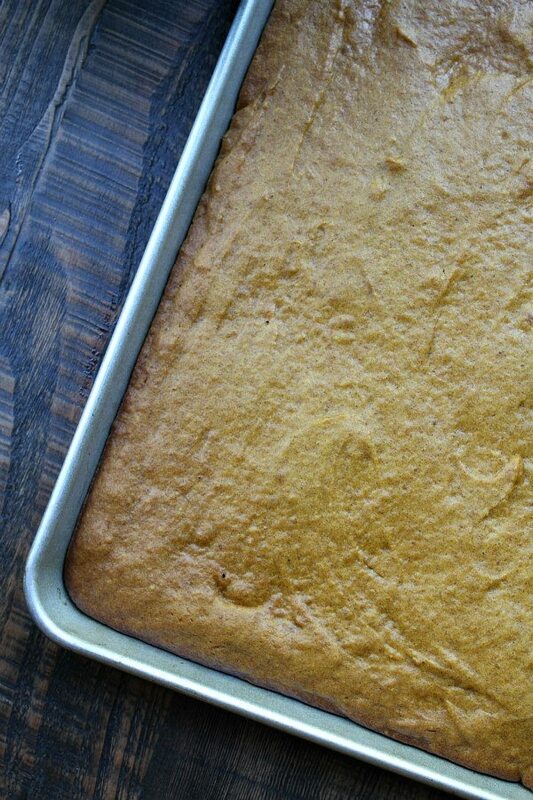 Your first order of business should be to make this pumpkin sheet cake! I’m partnering with Stevia In The Raw® this fall to share a few recipes that show you how to use this zero-calorie sweetener in your baking. 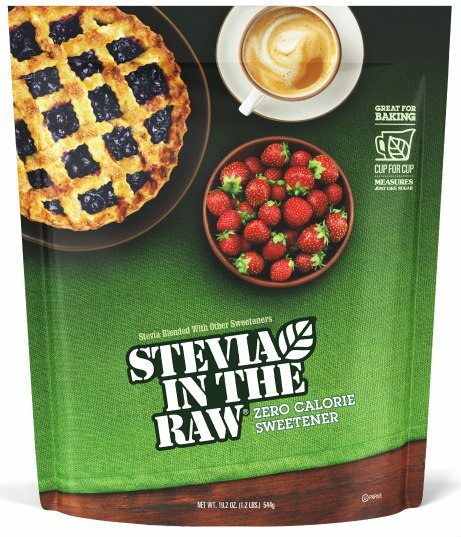 When you are baking with the Stevia In The Raw® Bakers Bag, it’s recommended that you only sub about half of the sugar in order to achieve the proper browning, rising and caramelizing that only sugar can provide. There are great things to be said about a sheet cake. It’s super easy to make because you just spread it out in a large pan. And it feeds a lot of people too! 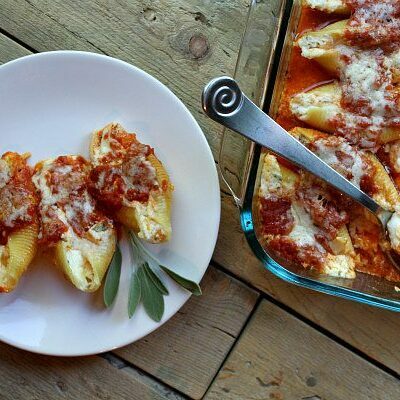 You do need a sheet pan to make this recipe. 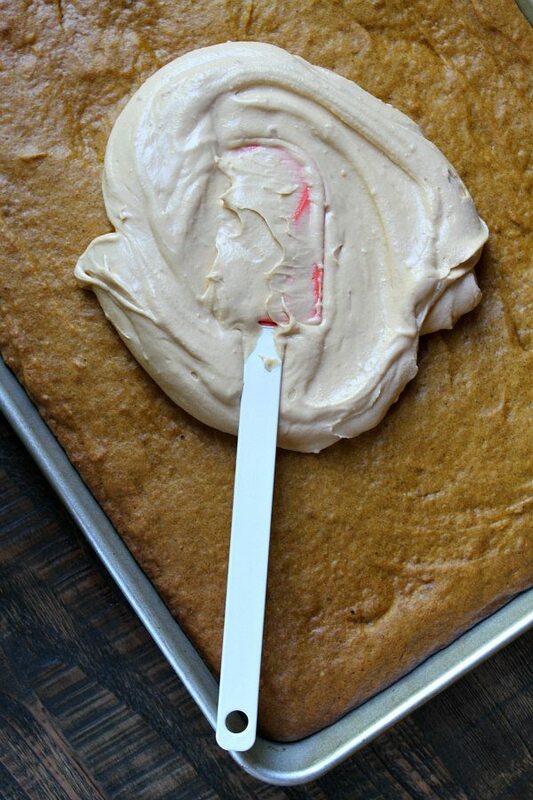 Sheet pans are also good for baking cookies, so you’ll get good use out of them. I recommend keeping two on hand for baking. You will thank me!! 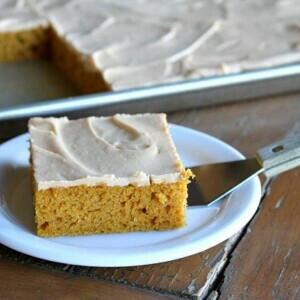 This cake is slathered with a good layer of butterscotch frosting. 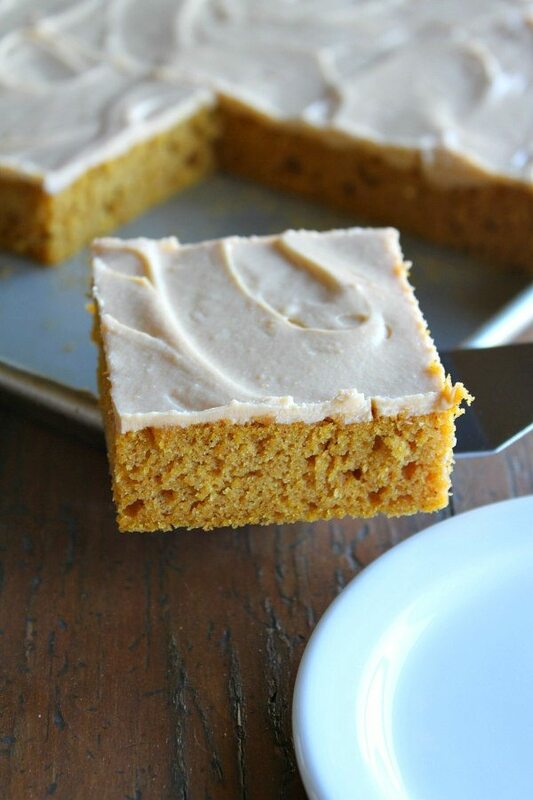 Pumpkin and butterscotch are great together! 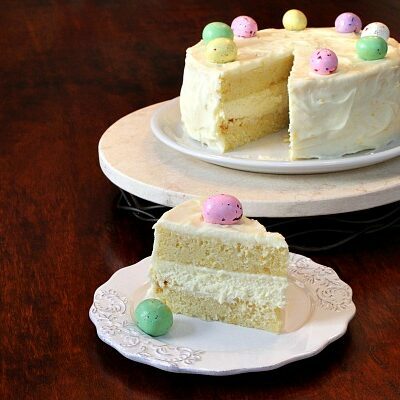 This cake has a reduced-sugar content because I’ve replaced a good amount of it with Stevia In The Raw®. Stevia In The Raw® contains extracts from the sweet leaves of the stevia plant, so that’s where it gets the sweetness to replace sugar. 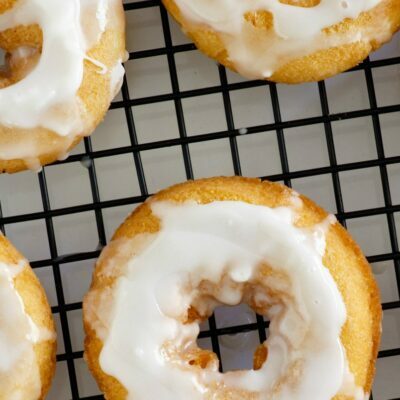 None of the flavor is sacrificed in the reduction of using regular sugar in this recipe. It’s still as sweet as can be, and it’s the perfect cake for fall baking! Preheat the oven to 350 degrees F. Spray a 15x10x1-inch sheet pan with nonstick spray. In a large bowl, use a whisk to combine the pumpkin, sugar, Stevia and oil. Whisk in the eggs. In a separate bowl, whisk together the flour, baking soda, cinnamon and salt. Whisk the dry ingredients into the wet ingredients. Scrape the batter into the prepared pan, and spread evenly. Bake for 25 to 30 minutes, or until a toothpick inserted into the center comes out clean. Let the cake cool completely. 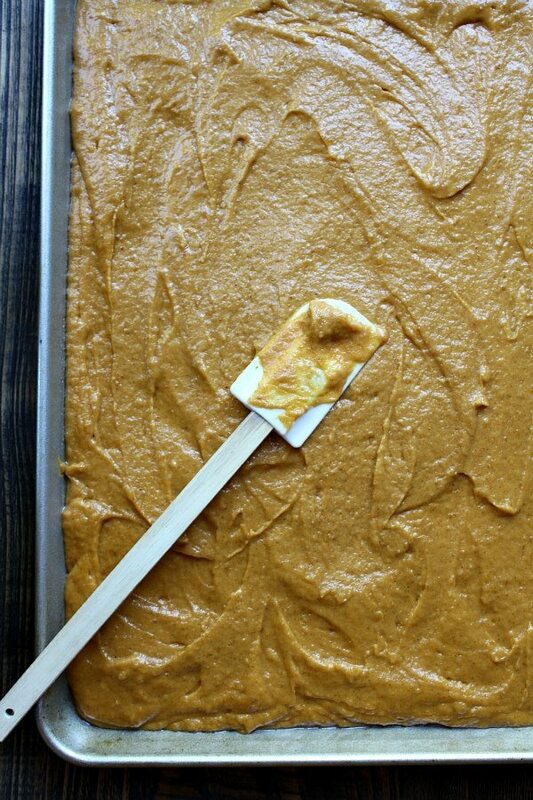 Prepare the frosting: Place the butterscotch chips in a glass microwave-safe bowl. Melt in bursts, just until melted. Stir. 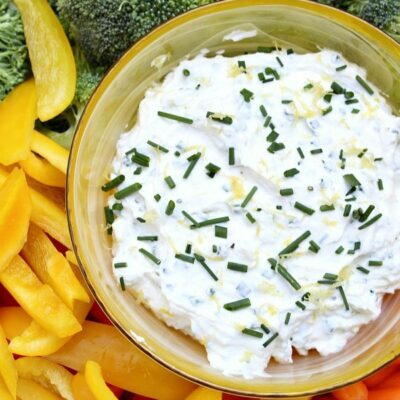 In a medium bowl, use a hand mixer to combine the cream cheese and butter until smooth. Add the sugar and Stevia and mix until combined. Add the melted chips, milk and vanilla and mix until smooth. Spread the frosting evenly over the cake. Refrigerate until ready to serve. 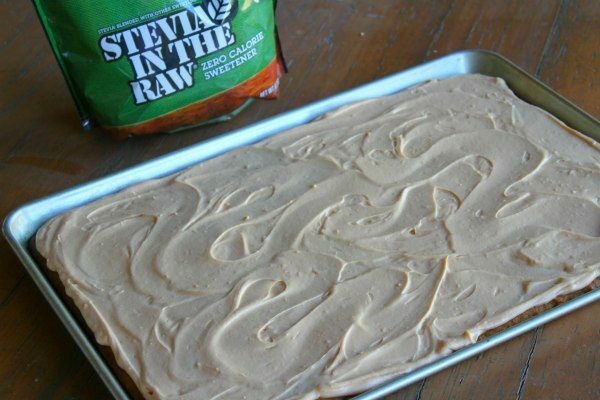 Disclosure: This recipe was made in partnership with Stevia In The Raw®. This is a product that I know and use in my kitchen. All opinions shared are my own. Hi Anne- you will find it in the baking section of your market– near the sugars. I wrote about it in the post, so please refer to that– photo of the packaging included too! Enjoy! I love that you made this with Stevia, so good with less sugar!